DIRECTV C41W-100 Wireless Genie Mini Receiver HD Client **New*. Shipped with USPS Priority Mail. This item functions with no problems. Includes 2 remotes, mini receiver, and the wifi kit. Lot of 3 DIRECTV genus mini receivers. Boxes only. The genie mini accesses the all the genie features from the main Genie box. DIRECTVs Genie Minis are the smallest full-featured boxes! When used with the Genie this box provides full DVR functionality in a box less than 5.9 wide. Directv Genie Mini receiver does HD programming and allows you to add receiver to your existing Genie HD DVR. Comes with power supply and remote. Worked perfectly when we upgraded and deactivated it. DIRECTV Mini Genie Receiver Model HR44-200 EUC. Condition is Used. Works and never used. Bought for a second TV and never set it up. What you see is what you get. Tanix TX3 mini specifications HD Digital TV Receiver Terrestrial Signal TV Tuner Ready. 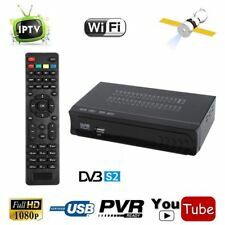 Receiver Support IPTV m3u Combo terrestrial Decoder Youtube Wifi Tv Box. USB – 2x USB 2.0 host ports. Misc – IR receiver, front panel LCD display. This sale is for Directv minie genie receiver model C61-700 directv and power supply used excellent condition (see pictures) if you have any questions about this item please feel free to message me thank you! 1-You have options you can buy cheap and get a headache, or. FTA SYSTEM: NOT WORK with. DISH NETWORK (FTA ONLY). Full HD FTA Receiver "Designed in USA & High Quality DVB-S2". Model Year: 2018. M1 HD "FREE TO AIR Only". External IR "You Can put this receiver behind the TV". DirecTV Reconditioned Mini Receiver Model C41-500C-R. Reconditioned to working factory condition. DIRECT TV RECEIVER HR54-700 & three C61-500 Genie Mini's with 3 remotes. See pictures for further details. All power supplies are included. No batteries for remotes. Two DIRECTV C41 - 500 Receiver HD Client (Genie Mini) with Complete Kit. Used. 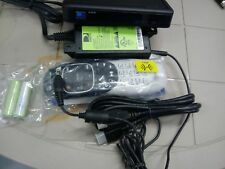 Two DIRECTV C41 - 500 Receiver HD Client (Genie Mini) with Complete Kit. Used.. Condition is Used. Will throw in extra remote, so it will come with two remotes. Shipped with USPS Priority Mail. Take a look at this great Directv receiver! Be sure to add us to your favorites list! Also, what is described & what you see in the picture is what you get. Condition: USED / TESTED / POWERED ON. Includes Genie Mini Receiver, Power Chord & Remote.